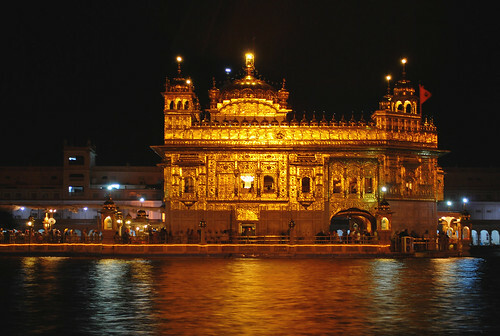 The Harmandir Sahib also known as Darbar Sahib and popularly referred to as the Golden Temple is a prominent Sikh Gurdwara located in the city of Amritsar, Punjab (India). Originally built in 1574, the site of the temple was surrounded by a small lake in a thin forest. Now, the temple is surrounded by a large lake, known as the Sarovar, which consists of Amrit ("holy water" or "immortal nectar"). There are four entrances to the temple, signifying the importance of acceptance and openness.